http://northamericanwordcat.booklikes.com Cat's Books: Romance 3.0 One More Soldier by Marie Sexton Review! 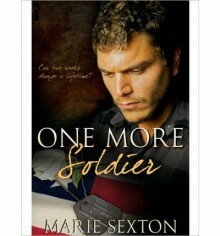 text One More Soldier by Marie Sexton Review! 3.5 Stars. Beautiful and touching story. What an amazing short story. So powerful, and just lovely... And dammit, I cried and cried. Straight onto my favorites shelf, although God knows I will never be able to read it again. A heartbreaking, sad and yet wonderful book. Despite the ending, it's worth reading.